Today, 90% of all imports are shipped, but shipping itself, like industry, has become invisible. The ships used to transport these materials and goods are built to withstand the force of the sea and storms and so they require huge amounts of energy to be dismantled. 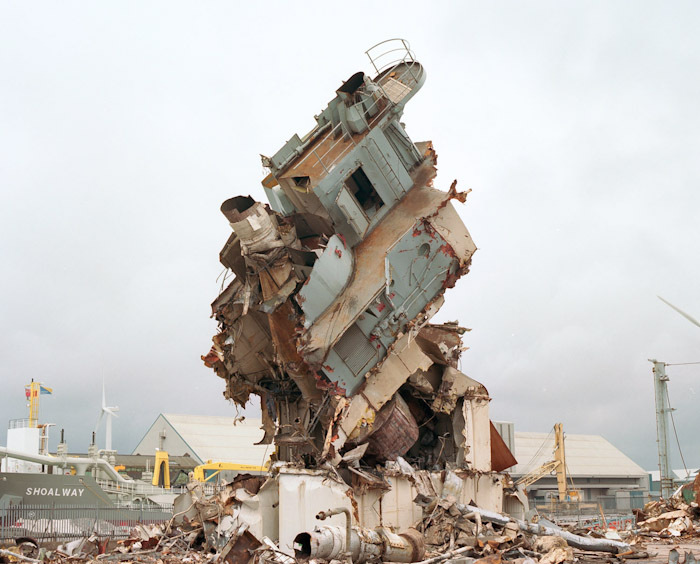 A Fish Out of Water is a two year photographic project documenting the dismantling of a 5000 ton Royal Navy Tanker. 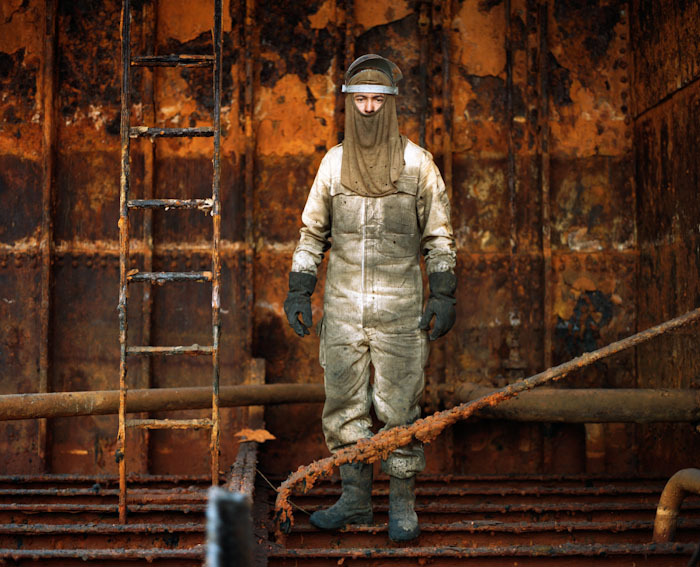 Working in Collaboration with social scientist, Professor Nicky Gregson, Tim Mitchell spent 2 years observing and documenting the rigorous and problematic physical process of ‘breaking’ a ship in a country where health & safety and environmental protection are paramount. Currently, through loopholes in the law, most EU ships are broken up on the beaches of Asia at huge cost to life and surrounding environment. An interesting interview with George Butler about his current exhibition in London and his working process. 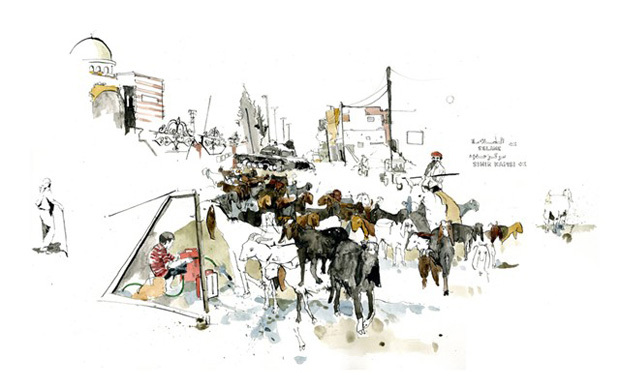 If you are in London over the summer and need a break from all the sun, how about checking out the reportage drawings that George Butler made in Syria? Butler’s recent work has won him both the editorial and overall winner of the prestigious V&A Illustration Award. His exhibition: A Year in drawing can be seen at the Illustration Cupboard Gallery from July 13th to August 3rd. In August 2012 Butler walked the 4 km from the Turkish border to the town of Azaz in Northern Syria. There he documented the displaced returning to their homes, which had been raided or damaged in the crossfire or shelling. Butler is not a stranger to war zones. He was an embedded artist with his uncles regiment in Afghanistan. While the news teams chased the action around in the forward operating bases, George was stationed at the camps. He soon realized that the soldiers actually spent most of their time training or teaching the Afghan National Army inside the camp. His drawings are a record of the soldiers there. Interestingly in the last 3 years, 2 of the winners of the V&A illustration Award have been reportage illustrators, Olivier Kugler won in 2011 for his 30 page illustrated Journal “Massih”- A Trucker in Iran. Which documents a four-day trip with an Iranian truck driver from Tehran down to the Persian Gulf. News: Illustration project is the inspiration for a major exhibition. Little did I know when I first started my project From the Loft Floor in September 2010 that it would lead to such a large body of work, with 50 drawings completed in 20 months. Now those drawings have become the inspiration for a four month long exhibition at the National Maritime Museum Cornwall about building wooden pilot cutters. Starting in September 2013 the exhibition From the Loft Floor will be displayed in the Quarter Deck gallery. The drawings are a visual diary of the building of a traditional wooden pilot cutter by Luke Powell of Working Sail. I am incredibly excited that this exhibition will not only feature my drawings, but also details of a boatyard with tools, workbenches, boat plans and half models. Tom Cunliffe the well known yachtsman, author and television presenter will be giving a lecture on pilot cutters to accompany this exhibition on 25th September 2013. Tickets will be available from the National Maritime Museum.